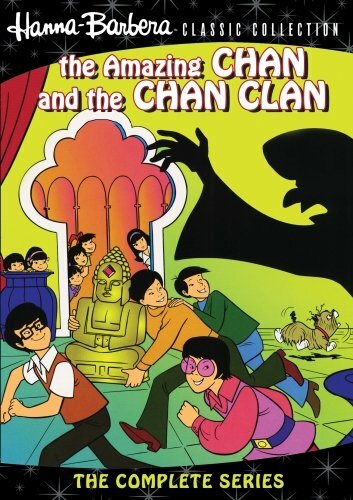 Bryan’s DVD Review of ‘The Amazing Chan and The Chan Clan!!! It’s such a delight to have The Amazing Chan and the Chan Clan out on DVD. This series, which only lasted 16 episodes, originally aired in in 1972 and follows Mr. Chan or Charlie Chan, his ten children, and their dog Chu as they travel across the globe and solve mysteries. 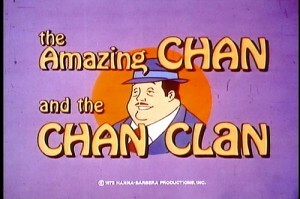 Charlie Chan sounds familiar to you doesn’t it? Like that name is in a song? That’s right, because it’s used in the Beastie Boys song ‘Brass Monkey’. Just a little side note. This release is one of those famous WB Archive releases. It looks very good. The Amazing Chan and the Chan Clan actually sort of plays out like Sherlock Holmes meets Scooby Doo. There is always some mystery to be solved and the kids and family dog help Mr. Chan solve the cases around the world. The Chan clan even travels around in a van like the Mystery Machine in Scooby Doom but the Chan’s vehicle can change into other forms of transportation with the push of a single button. There is a big-time oscar winning actress who was a part of this show. Her name is Jodi Foster and she voiced Anne Chan, a feminist tomboy, who wears an orange-on-white t-shirt with a matching baseball cap. She alternates between guitar and percussion for the kids’ band. Enter the Chan Clan, the kid’s family band name. 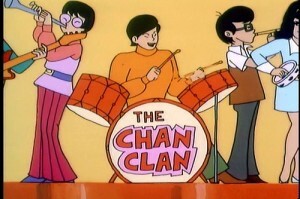 In each episode, there is a different song the Chan clan sings and all of them are sung by Ron Dante of The Archies. Most of the mysteries involve valuable items that have been stolen, but some of the mysteries involve a kidnapping and a sea cruise performance. All in all, it’s a really fun show. It only lasted 16 episodes, but once you watch the first episode, you’ll be sucked in. The video is in full frame and presented in 1.37:1. There is no glorious 1080p here, but the transfer for this film being 40 years old looks very good. The best it has ever looked. This is a very colorful show with tons of bright colors. There are definitely problems with it, but that comes most of the Warner Bros. archive releases. It says that this release is one of the made-to-order DVR releases, but it doesn’t look that way to me. The audio has a Dolby Digital Mono soundtrack and I so wish this had lossless 5.1 DTS-HD sound. Strictly for the music. It would have made the audio so much better. Pretty much all of the original voices were so bad and almost unintelligible that the voices were quickly re-cast with American actors and dubbed over. It sounds a lot better. The video presentation is better than the audio, but I’m not complaining to much since, again, it’s a Warner Classic Archive title. This is a great release and a lot of fun to watch again. The transfer looks good for it being full frame and not HD. I only wish the sound was a little better. It would also be cool to have some extras on these releases. But where else are you going to find these glorious and rare tv series and films. The WBSHOP has the series for $29.95 where as Amazon has the pre-order up for $35.99. The Amazing Chan and the Chan Clan will be released on July 19th. I find this far too expensive fort his series. If you can find the set for $19.99, buy it. BUY DIRECTLY FROM THE WBSHOP HERE!!! DVD Review: ‘Impractical Jokers Season 1’!! Bryan Reviews ‘Young Justice’ Season 1 Volume 2 DVD!!! Bryan Reviews ‘Tom and Jerry: Fur Flying Adventures Volume 3 DVD!!! This entry was posted on Wednesday, July 11th, 2012 at 9:11 pm	and is filed under News, Television. You can follow any responses to this entry through the RSS 2.0 feed. You can skip to the end and leave a response. Pinging is currently not allowed. « Darren Aronofsky Tweets Photo From ‘Noah’!! !